Now, see Christ? Yes? Good. So, I want you to fix your eyes on the slab of the tomb pointing directly towards you on which he is standing and keep looking at that stone as you walk all the way past the tapestry. And so it came to pass that, following the instructions of Antonio my expert Vatican Guide, as a rookie tour manager fourteen years ago, aged only 23, I walked past Christ and discovered that tapestries are fascinating; the slab, woven nearly five hundred years ago, no matter from which angle I gazed at it, pointed directly at me. Incredible. Later in that, my début year of being in charge of other people’s holidays, I lead a group through Normandy. Obvious destination; Bayeux and it’s world famous 230 ft long tapestry, depicting the events leading up to, the battle itself and the subsequent happenings post Battle of Hastings. Here the first thing you learn is that this masterpiece is in fact not a tapestry at all, but an embroidery. Thou Kiddeth?! 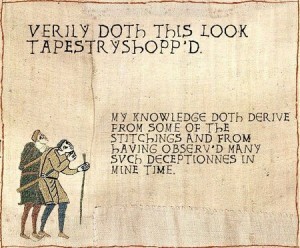 Not a Tapestry?! Does this matter? 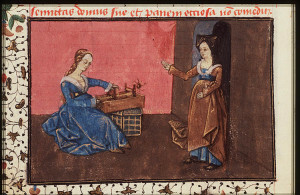 Well, the particulars of its creation, not woven on a loom, but stitched by hand (or many hands, to be precise), are of interest perhaps only to the pedantic. However, as an incredible example of political propaganda – one King justifying his reign over an occupied Kingdom, it is fascinating. As I always tell my groups; it is a case of history being stitched by the winners. 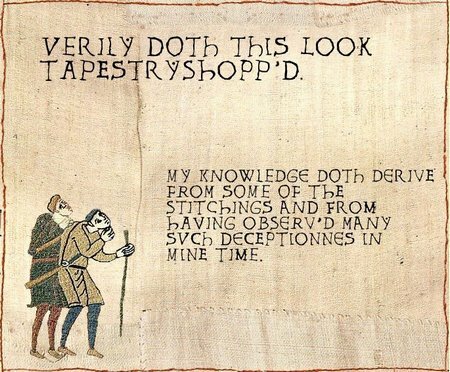 The question, to which I have never found answer is; why not simply ‘The Bayeux Embroidery- equally impressive, no? 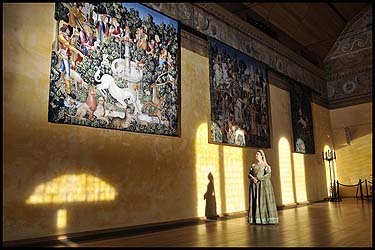 During hundreds of subsequent visits to galleries, castles, churches, whose Medieval walls are often hung with huge tapestries and after seeing entire towns whose economies depended virtually entirely on the production thereof, I have developed a fascination for these woollen Renaissance tapestries. Add to this my constant speculation on why I travel, what I am looking for or indeed escaping and a dose of Zen, for want of a better word, tapestries are an obvious metaphor for how we lead our lives and what we chose to weave into them. 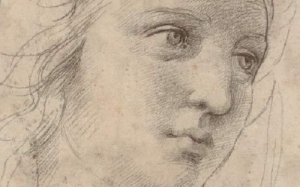 Renaissance master weavers were sent cartoons – the word ‘cartoon’ comes from ‘cartone‘ – or large paper in Italian, often by artists such as Raffaello, the designs of which they would follow. The scenes were religious, inspired by the Bible or often Ovid’s Metamorphoses. Viewed with our modern eyes they are decorative, hugely impressive, especially when considering the hours of work involved in their creation, but all too often thought little more of. For example in the case of the series Rafaello ‘designed’ between 1515-16 for the Sistine chapel, they hang in ‘yet another room’ on the long march to Michaelangelo’s frescoes. The guides, eager to keep their groups conscious, point out tricks of the eye such as the ‘moving slab’, leaving much unsaid about their design, creation and most fascinatingly of all, purpose. And their purpose is fascinating. Le Corbusier, the Swiss-born pioneer of modern architecture, used the excellent term ‘nomadic murals’ to describe Medieval tapestries. The clue is indeed in their mobility. As teaching aids they were hung in churches, priests using the easily identifiable iconography to make the bible come alive to their largely illiterate congregations. Tapestries – Best Draft Excluder? As decorations they were hung in huge Renaissance halls their purpose being to impress and create fashions. Finally as insulation they were hung in large medieval dining halls of castles were dampness and winter chills were dispersed thanks to these woollen bastions against the cold. Where I have found thinking of tapestries crosses into becoming something more than just an appreciation of art, and into something of an allegory for life, comes when looking at what makes a ‘good’ tapestry. 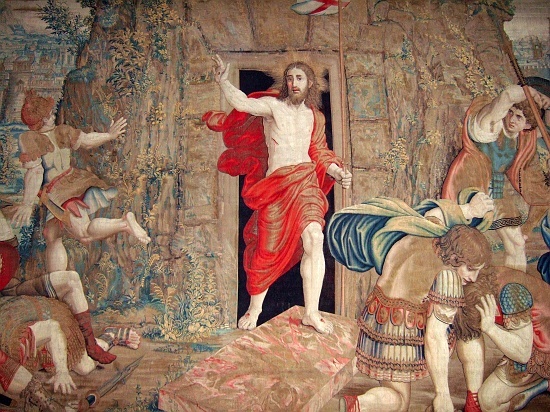 The quality of any tapestry depends mainly on four variables; the beauty of the cartoon from whence it is ‘copied’, the skills of the weavers in translating the design into woven form, the fineness of the weave itself and finally the selection of the materials from which the tapestry is made. ‘Life’s rich tapestry’ we are often quoted, especially when something goes against our best laid plans or life seems to turn against us. We are reminded we must take the rough with the smooth. Yet what control do we have over this? Our creative and dreaming minds are often capable of creating the most beautiful of cartoons; designs for life. How we see others, how we wish to portray ourselves and our plans for the future. Yet, how often are we let down by our skills as ‘weavers’ in turning things into reality. How often are we misunderstood and regretful that we cannot transmit that inner cartoon to the world? We are given only the one loom with which to weave. Though we can strive to improve, fine-tune make this the best loom we can, it may never be one capable of producing the master pieces we strive for. Only a poor craftsman blames his tools and as humans we have the awareness to acknowledge this imperfection and do our best to overcome it. Finally, and perhaps most intriguingly of all, the fourth ‘ingredient’; the materials we are given. The wool, the strings with which we weave. Where do they come from? Are we capable or indeed responsible for sourcing our own wool, or have we no choice? When it comes to weaving our lives, and this is ignoring the fact that we may to make matters worse, have no control over the cartoon we have been given in the first place, are strings placed on our looms for us, or can we source them? You have to believe the latter, the freedom of choice. 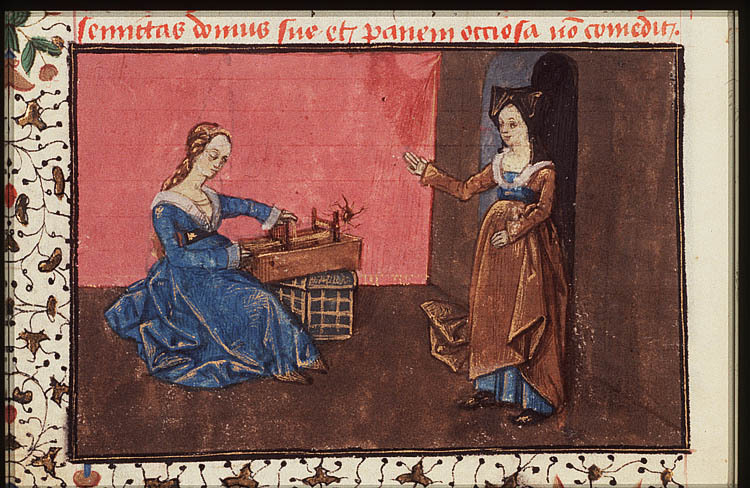 The loom as a metaphor for life works. We are given a limit, defined by its wooden frame. Whoever has made us, or the circumstances in which we find ourselves are the cartoon we as weavers have been sent. But the strings, the colours, the fineness of the yarn and indeed much artistic freedom are all placed on our palette and we are told to get on with it. It was following such a ‘string’ to Edinburgh recently (most of my strings involve travel) that I stumbled across Dovecot Studios. Amidst the hurl and burl of the incredible Edinburgh Festival, which I was attending, few places could have provided such a calming contrast. I had no idea that tapestries are still being made. Having never really contemplated one less than a few centuries old, it was fascinating to see the process alive and well in this modernised 100 year old tapestry studio. On the morning of my visit, fleeces were being delivered by individual farmers who would later be back to view the modern day creations into which they are being woven. 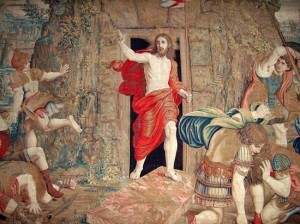 Next time I am about to be escorted past the ‘moving’ tomb of Christ the Resurrected in the Vatican, I shall urge the guide to speak a few words on the tapestry itself. Whether any Medieval Lord surrounded by his fine collection of Renaissance tapestries, snug and sheltered from a howling storm in his lonely castle ever glanced up gratefully from his dining table, who knows? Perhaps if he did, he too might have reflected upon the tapestry he was weaving his life into. I certainly have things I wish could have been prevented, blotches on my tapestry, occasions where the wool could have been finer, but ‘at the end of my time on earth‘ we all have to roll up our tapestries and claim them as our own. Proudly? There is another matter. The Dovecot Studios in Edinburgh are well worth a visit. There are some great modern artists at work. The museum-studio is free and there is a great little coffee shop attached in which to have lunch. Visit their website for a look here. ~ by 2ndcupoftea on August 27, 2013.